Each year the Big Bear Alpine Zoo receives well over a hundred animals that have been impacted in such a way that they cannot survive in the wild without intervention. Depending on the year, it can be many more than that, or sometimes a little less. We are always inundated with orphaned animals in the spring. 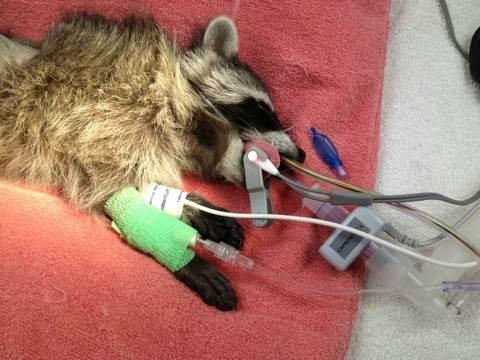 Well meaning people bring in baby raccoons, birds, skunks and squirrels who appear to be orphans. Once the babies are taken away from their mother, their lives end up in our hands. We almost always end up bottle feeding and with great luck, we are able to teach them to fend for themselves and can send them back into the wild. If that is not possible, the animal will end up in our care. If we are called about the babies first, we urge the caller to leave the babies alone and wait for mom to come back. Most of the time, the parent is off looking for food for their family. Imagine the mother’s horror when she comes back to the nest or den and her precious babies are gone. We are proud to be one of the “go-to” facilities for the California Department of Fish and Wildlife and the US Forest Fish and Wildlife Service for the San Bernardino National Forest. When there is an animal in trouble, hit by a car, injured or confiscated for illegal possession, we are here to help. We believe that each life is worth trying to save! Every animal that comes to our facility has been orphaned or injured in some way. They need our help to reach a state of health where they are capable of surviving in the wild. We are proud to have several veterinarian technicians on our staff to see to the day to day medical needs of the animals. They are able to dispense medications and tend to the animals small needs. We have a quiet rehabilitation area in our medical room where the animals are able to rest and get better. When we are in need of a veterinarian, we utilize the services of the local VCA Veterinary Hospital and their staff or call in specialists. The medical care for all of these animals is quite expensive and is funded by the admission paid to the zoo and generous donations from people like you. We believe you can’t put a price on the life of an animal and do our very best to give them a second chance. Over ninety percent of the animals we receive are released back into the wild, but some of them are just too compromised. For those animals that can’t be released, we try to give them a good home for the rest of their lives at our facility. Our collection will always vary, dependent upon the types of animals that need a home and our care. When we don’t have enough room for the animal, we work diligently to find another facility that will take them. There is nothing quite like the feeling you get when you see a healthy bird soaring away or an animal running into the wild, back where they belong. The amazing staff of the Big Bear Alpine Zoo does everything possible they can to make sure this happens as often as possible!